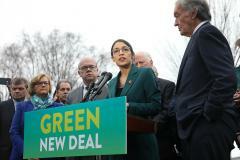 The dirty little secret of the Green New Deal is not that it is an unserious proposal that has nothing to do with the environment and everything to do with the sense of entitlement of elite progressives. That is not a secret at all. It is common knowledge. The secret of the Green New Deal is that this valentine to socialism from Senator Ed Markey and Representative Alexandria Ocasio-Cortez is already obsolete. For the American people have already passed their Green New Deal, through the miracle of free market innovation — not in the House and Senate but in the Permian Basin, at the Bakken Formation and the Marcellus Shale. The left will not admit it, but the fact is Americans are living in a golden age of clean energy, right now. Jim DeMint served as a United States senator from South Carolina. "greed deal"...Always appreciate you comments. For some reason I receive quite a few comments on the Facebook posts, but not too many here on the blog. Guess it is just easier to comment and post on Facebook. Just wanted you to know I always take note of your comments, even though I don't have time to respond. Frank.......what I appreciate most is that you often post interesting and relevant article links that a person never sees anywhere else. Very informative. Of course you realize some of my comments are just expressions of frustration with some of the unbelievable things going on today in our world. Yes......I guess it is easier to post on FB........and I think one of the reasons folks tend to post there is that rightly or wrongly they believe more people will see their comments. Another thing is..........sometimes it is just good entertainment to go back and forth with comments...........when you encounter a rabid leftist.